One of our favorite “getting ready” photos of all time, this image of a bride’s dog licking the tip of her nose was taken on her wedding day at the Mallard Island Yacht Club in Manahawkin, NJ. The curlers still setting in her hair set the scene for the preparations at hand, while her beloved pups paws over her shoulder add an element of embrace to the image. 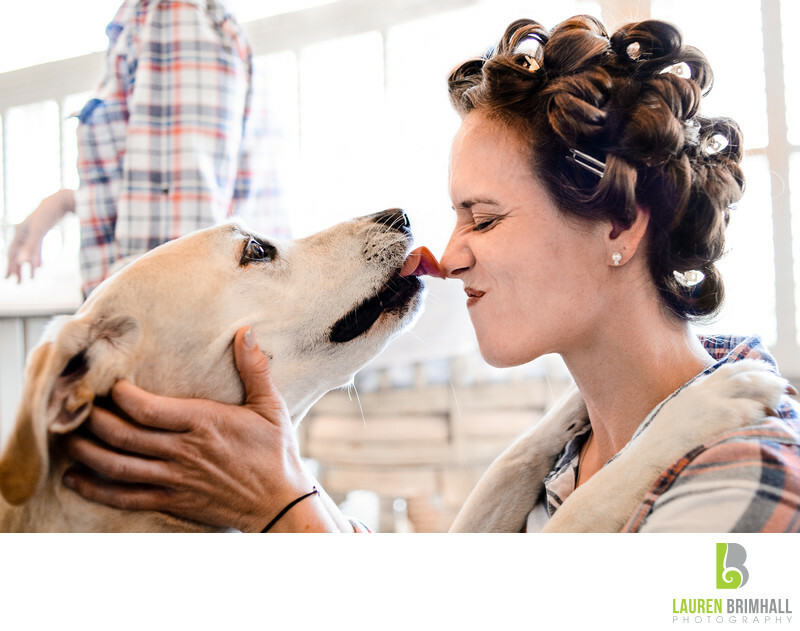 The photograph is shot at close distance to highlight the bride’s mixed expression of enjoyment and disgust, as well as the sharp detail in the dog’s eye’s and tongue. This particular bride considered this “fur baby” a close and valued member of her family and wanted him present for as much of the wedding day as possible. The yacht club was gracious enough to allow the dog into their lavish bridal suite for a short period of time. The top-floor suite was beautifully furnished and offered a stunning view of the water below. Lauren Brimhall Photography specializes in totally unscripted and genuine moments just like this one, which are among the most difficult to master. The wedding took place in October of 2016, and has long remained a company favorite, with other images from this day taking home a number of awards.